The hip is a "ball-and-socket" joint. 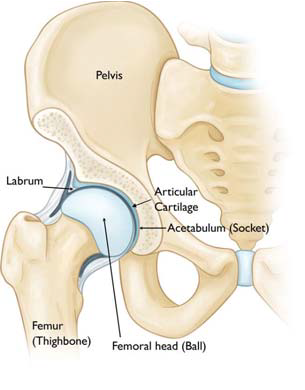 In a normal hip, the ball at the upper end of the femur (thighbone) fits firmly into the socket, which is a curved portion of the pelvis called the acetabulum. In a young person with hip dysplasia, the hip joint has not developed normally—the acetabulum is too shallow to adequately support and cover the head of the femur. This abnormality can cause a painful hip and the early development of osteoarthritis, a condition in which the articular cartilage in the joint wears away and bone rubs against bone. Adolescent hip dysplasia is usually the end result of developmental dysplasia of the hip (DDH), a condition that occurs at birth or in early childhood. Although infants are routinely screened for DDH, some cases remain undetected or are mild enough that they are left untreated. These patients may not show symptoms of hip dysplasia until reaching adolescence. The magnitude and severity of hip dysplasia can vary from patient to patient. In mild cases, the head of the femur may simply be loose in the socket. In more severe cases, there may be complete instability in the joint and/or the femoral head may be completely dislocated out of the socket. Treatment for adolescent hip dysplasia focuses on relieving pain while preserving the patient's natural hip joint for as long as possible. 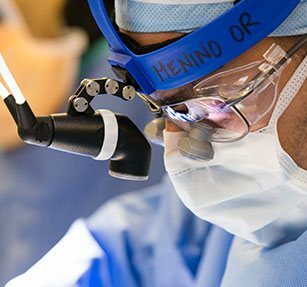 In many cases, this is achieved through surgery to restore the normal anatomy of the joint and delay or prevent the onset of painful osteoarthritis. The hip is one of the body's largest joints. It is a "ball-and-socket" joint. The socket is formed by the acetabulum, which is a part of the large pelvis bone. The ball is the femoral head, which is the upper end of the femur (thighbone). The acetabulum is lined with fibrocartilage called the labrum. The labrum creates a tight seal to hold the femoral head in place. What are symptoms of hip dysplasia? Some patients may also experience the feeling of locking, catching, or popping within the groin.